We have no choice but to test lamps. Sometimes it's fun, but typically it is tedious work. Measuring, rewiring, marking down results, comparing, loading spreadsheets, analyzing. Comes with the job. Still, I love the work and I get to work with a lot of interesting people in UV curing. Professional shops, small shops, serious hobbyists, and guys with too much time on their hands and love of building interesting things. I figure, if I have to test anyway, lets have some fun with it. I will confess a deep love of the Fender Telecaster. I'd owned used guitars since the 70s, but my first "new" guitar was a 1994 Fender Telecaster, a gift from the wife on our 1st anniversary. I post over at Telecaster.com regularly, I played in bands for over two decades, can wire a guitar, swap necks or tuning machines, bridges, the basic stuff. I even expect to file my first guitar nut soon, but there is one task that simply scares me: Finishing the guitar. I've tried in the 1980s, but failed in a large way on an Ibanez Iceman II. Had it hanging in the kitchen from a coathanger while I finished it. (in my defense, I was single and young) I still have it in 100 parts, just haven't finished the job. I'm very handy in many ways, but even if we use the most generous definition, I am no luthier. With that in mind, I've set the bar a bit lower here. 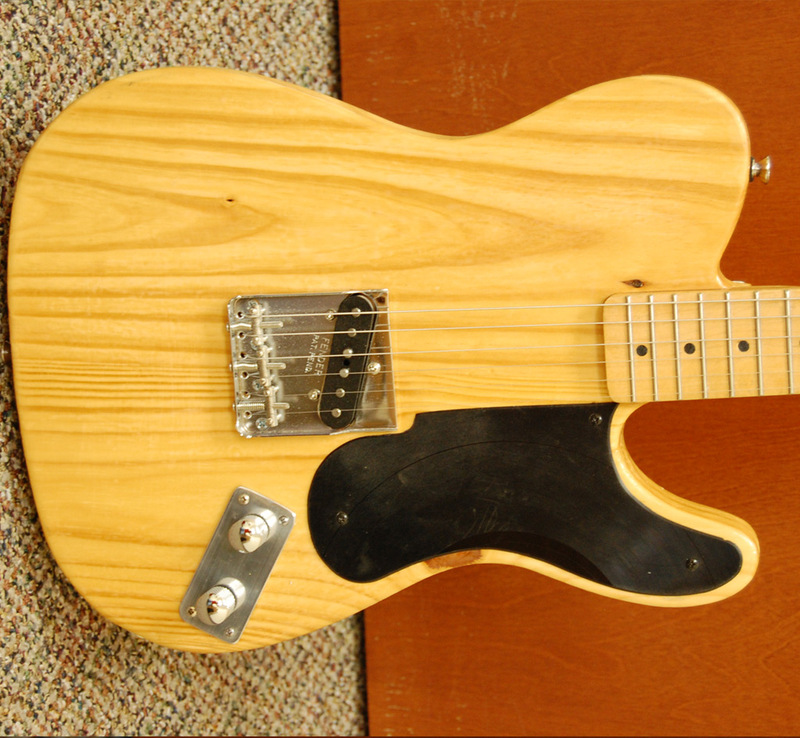 Setting the bar low doesn't mean "not cool" however, as I've decided to create my own version of Leo Fender's first success, the Esquire, the Broadcaster, the Telecaster. 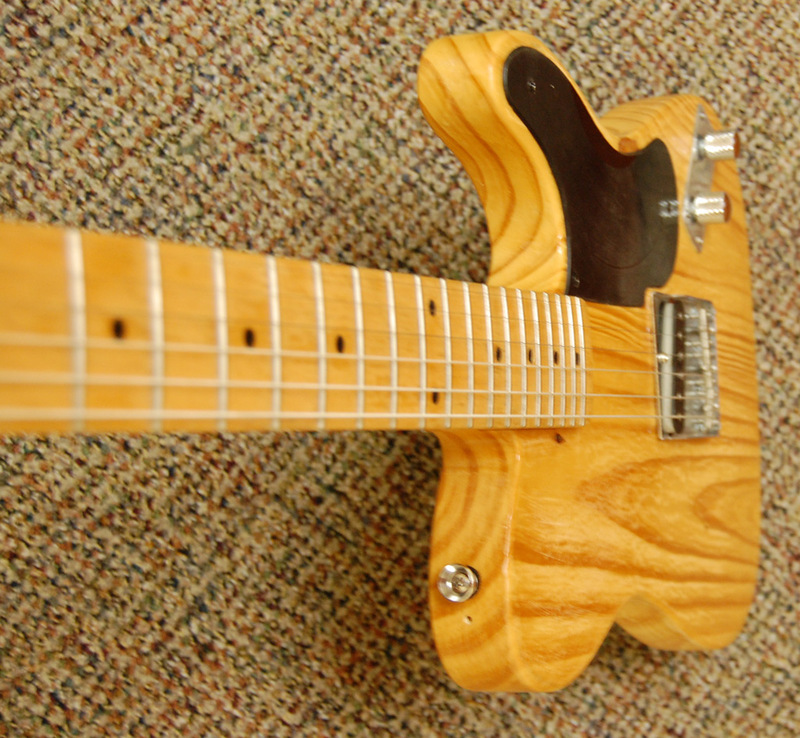 Pine body, single pickup, simple controls, function over beauty. We start with a clean but rough body purchase off eBay for around $40, including shipping (shown upper left). it is hard to go wrong at this price. It includes the control plate and a pickguard that is actually made from an album, grooves and all, adding to the cool factor. 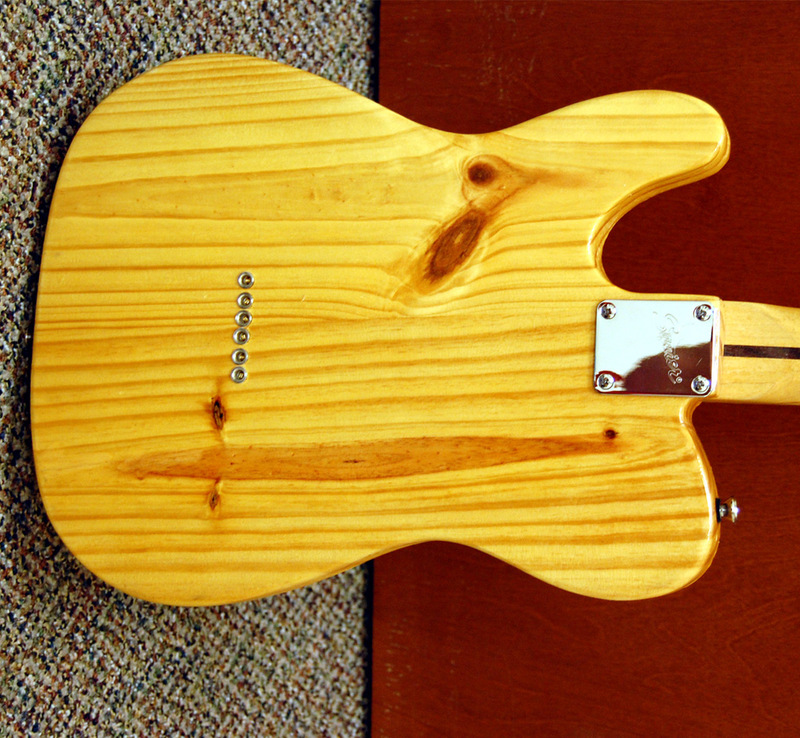 This photo shows what we are starting from, raw pine in the shape of a Telecaster. Most of the real details won't be published here, they will be at the Solacure Blog, we will just touch the highlights. And it isn't a race, it will take awhile to finish because there other things to do, like sell and pack and such. The key reasons I chose to test our lamps (and my skills) on a Leo Fender Protoype are probably obvious, it is the simplest guitar, it is supposed to be a bit rough around the edges, so perfection isn't required, and it is mainly wood, so you have a beautiful pallet to display, plus it is pine, which is softer and easier to work with. And the idea of recreating a prototype guitar with prototype lamps, using some prototype methods....I think Leo would approve. To the right, you see #1 in all her glory. What I won't be trying to do is clone it. I have a different goal, I want a clear finish for starters, and while I love the snake head headstock, I will use of the necks I have on the shelf, including a Fender Cabronita 22 fret neck, and gold series Squire 22 fret neck. I haven't decided, but odd are the Squire will be sacrificed so I can strip the logos and finish off the neck, getting it down to raw wood. Since this is exactly what Prototype #2 used (sans the truss rod), I think is the close enough and saves me a few hundreds bucks, as snake heads aren't easy to come by. Think of it as spiritual copy of a Prototype 1.5. In the Tele world, we have another name for it: it will be a type of Barncaster. Will this show all the possibilities of Solacure lamps? No. In some ways it is a tax deductible way to feed my Telecaster lust, but mainly it is gain knowledge. It will help me learn about the trials that hobbyists go through, test some different methods of using the lamps. I expect to age the wood, as I want it to look old and worn a bit, like a board that has been lying in the back yard too long, so it will give some real world examples of the wood darkening (in the case of pine) abilities. It is also a way to demonstrate that even an idiot can do this, and I'm just filling in the role of idiot. They say you learn from your mistakes, and if this was true, I should have a Masters Degree in building guitars by now, because I made plenty along the way. The finish came out very uneven and I ended up sanding much of it down. I had put it on too thick, being too impatient, and basically did it all the wrong ways. Still, I like the look of it, very much a "made out in the barn" look: Very obviously home-made, which is part of the goal. To be honest, I'm not shocked. I put lots of care but I just didn't know what I was doing and didn't read up. But I'm a player, so that is what really matters. Play-ability is pretty good. Tone is amazing. 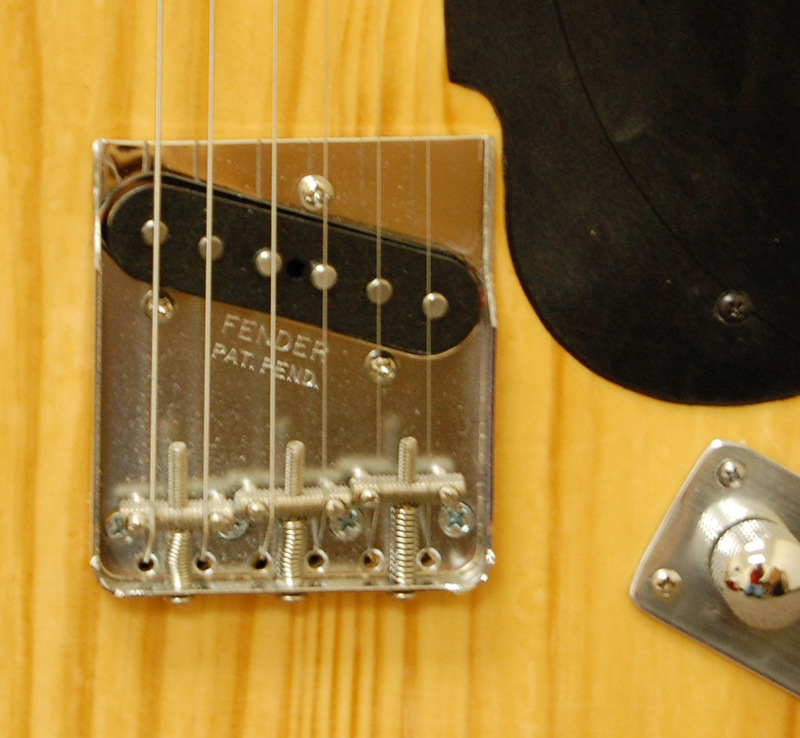 The 1962 Vintage Fender pickup paid off here. They aren't expensive, but they are a great mid price pickup that sounds as good as some of the Custom Shop pickups that I use. It has twang, it has sustain (how, I have no idea) and it sounds much like I would have expected Leo's first guitar to sound. In that respect, I think I hit a home run, even if my finishing skills lack finesse. Even with the rough finish, she is still pretty, with all that sun-baked (or rather, Solacure Univeral UV light baked) golden tone coming through. It started out bleach white, keep in mind. The face is fairly clean, which is what I was looking for. Just a couple of small knots, plus a knot under the pickguard. It really does have a really nice grain that reminds of of the more expensive swamp ash guitars. I knew this when I bought the blank, but just hoped the aging process would bring out the grain nicely. I lost a little of the contrast as the lighter wood darkened more than the grain, but not too much. 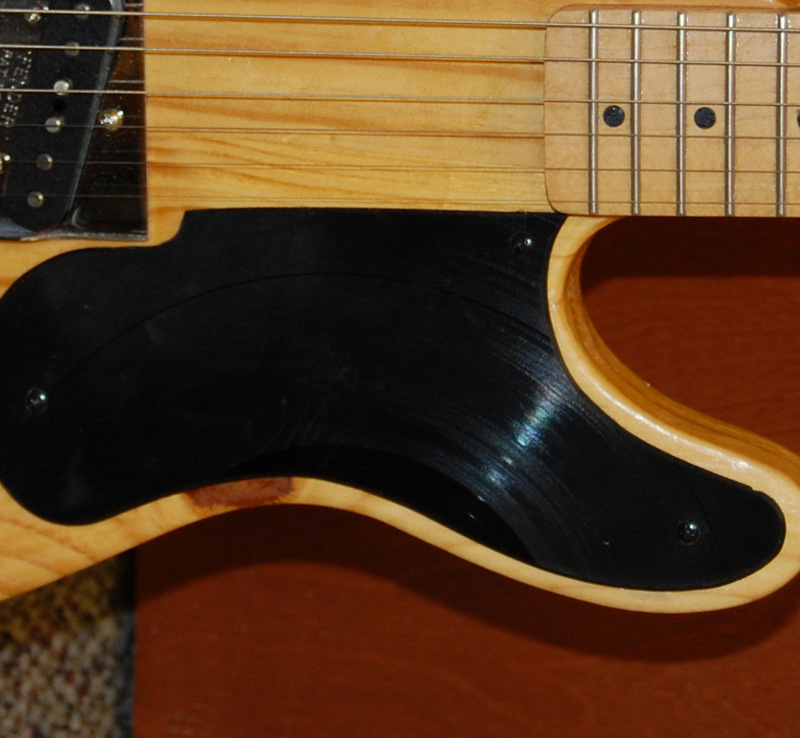 Here we see the pickguard, which is an old vinyl record. Not a 78 like Leo would have used, and instead a 33, but the effect is the same. You can see the knot under the bottom of the pickguard. To me, this really brings an authenticity to the project, and played a role in my choosing this particular body for building a prototype.